Banksia is a member of the protea (proteaceae) family and is a genus of around 170 species named after Sir Joseph Banks who was the first European to collect specimens of these plants in 1770. With their beacon-like blooms they range from groundcovers to trees and just about everything in between! Despite being such a popular Australian plant, there are some banksias listed as rare or threatened eg, Banksia brownii, the Feather-leaved Banksia and Banksia verticillata, the Granite Banksia both of whom are endemic to the South Western corner of WA between the coast and the Stirling Ranges. South western Australia contains the greatest diversity of banksias, with 60 species recorded. They are also an important part of the flora of Australia's eastern coast. 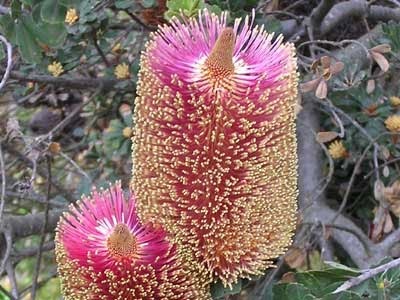 Few banksias are found in the arid regions of Australia or in the rainforests of the eastern coast. There are no species which are common to eastern and western Australia except Tropical Banksia, Banksia dentata, which occurs across northern Australia, in Papua New Ginea, Irian Jaya and the Aru Islands. Most species prefer an open sunny position and well-drained sandy soil low in phosphorus. Species native to Western Australia are prone to root-rot fungus and generally do not grow well in Coffs where our main rainfall is in the summer. The flower heads are made up of hundreds of tiny individual flowers grouped together in pairs. These heads produce large volumes of nectar and attract many birds and small mammals to feed on them. The colour of the flower heads usually ranges from pale creamy yellow to red. Although there are some lovely almost iridescent green ones as well. The fruits of banksias (called follicles) are hard and woody and are often grouped together to resemble cones. The fruits protect the seeds from foraging animals and from fire. In many species the fruits will not open until they have been burnt or completely dried out. Formative pruning is important if you desire compact growth so any vigorous growing shoots on your young plant should be tip pruned to encourage the plant to branch out from the base. Maintenance pruning (after flowering) can just consist of snapping off the spent flowers, pruning back any dead or dying wood or any unsightly leggy growth. Example left of a Banksia that is overdue for a little tidy up! You can sacrifice a little bit of older wood but keep as much as you can because that’ll produce more blooms for next year and help with the compact shape. At this time apply some low phosphorous native plant food. Flowering season, depending on the species - Summer, Autumn and Winter.